On December 4, Burns Library at Boston College hosts a lecture by Emanuele Colombo, a Senior Research Fellow at the Institute for Advanced Jesuit Studies. 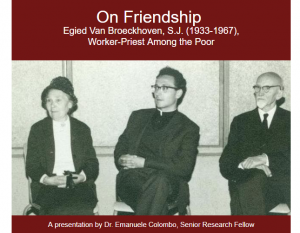 Colombo’s talk is entitled “On Friendship: Egied van Broeckhoven, S.J. (1933-1967), Worker-Priest Among the Poor.” Van Broeckhoven was a Flemish Jesuit who spent much of his ministry in the factories of Brussels. During this work, he kept a diary, in which described the value of friendship that, in his view, opened up a path to God through the encounters with others. The lecture begins at 3pm, with refreshments to follow. The event is free and open to the public. To register, please complete this form. Colombo is also Associate Professor and Chair of the Department of Catholic Studies at DePaul University, Chicago. To learn more about his research and about the in-residence fellowship program at the Institute for Advanced Jesuit Studies, please visit the Institute’s website.